Amsterdam, The Netherlands – Philips continues to lead the smart lighting revolution by launching ‘Friends of hue,’ stepping beyond light to bring dynamic immersive lighting to the home through your fingertips. A Friend of hue is any product or app, created by Philips or an independent developer that integrates and works seamlessly with the hue lighting system. By introducing Friends of hue, Philips is amplifying the possibilities to feel and experience light – from transporting your TV experience to the whole of the living room making it more immersive than ever before, to bringing stories to life with light, making them more magical. Inspiring new ways to experience light, the new LivingColors Bloom and LightStrips Friends of hue connect to Philips hue so that you can create a fully immersive experience using the hue app where light, color and even music come together to instantly transform the ambiance in your home. New LivingColors Bloom Friends of hue is compact, portable and smart, it can connect to the Philips hue app and delivers over 16 million different ways to color your home at the swipe of a finger. Whether you choose to match color light to a moment, add accents to your home, light a space with a splash of color or wash a wall with stunning shades, this flexible light source can be placed wherever you need it. With up to 120 lumen light output, you can highlight a favorite spot and then programm LivingColors Bloom Friends of hue to gradually dial down the intensity to blend soft, smooth tones across a room. Taking advantage of its hue capabilities, such as internet automating service IFTTT (If This Then That), set your new LivingColors Bloom Friends of hue to gradually change color as the sun sets helping you to create a relaxing environment into the night. With its hue enabled geofencing features, your smartphone or tablet can detect when you’re almost home and trigger LivingColors Bloom Friends of hue to automatically turn on to the perfect shade of ‘welcome home’ for you. LightStrips Friends of hue is innovatively designed to deliver ‘indirect’ light that can be bent and fixed in whichever way you desire to personalize your home lighting experience. Choose from 16 million colors to match your light to any moment. Whether you wish to highlight a key piece of furniture or a much-loved fixing, with LightStrips Friends of hue it is easy to create striking architectural features in your home. These flexible 2m LightStrips Friends of hue bring complete design freedom to your home lighting, so you can let your imagination run free; run them along a shelf to add depth to the ambience of a room, under the TV to accentuate your viewing experience or simply wrap it around a favorite painting to add design flare to your home. With its rich and colourful tones, LightStrips Friends of hue can make cooking a dinner party seamless; simply set an alarm for your lights to glow a warm red when dinner’s ready using the hue app on your smart device. You can even trigger memories with friends via a feature in the hue app that lets you use a photo on your phone as a color palette to paint the room with light, creating a very special ambience. Ambilight Friends of hue app for Android and iOS smart devices, expands your TV experience into the whole living room making it more immersive than ever before. It opens up numerous possibilities to create unique ambient moods using light, to deliver an immersive viewing experience where color matches what’s on your screen to the hue lights in the room. Similarly with Philips and Disney Imaginative Lighting StoryLight Friends of hue, the innovative Mickey Mouse shaped light cleverly synchronizes colored light with classic Disney stories read through an interactive e-book on an iPad. As you read with a child, all the colors of the rainbow light up the world of the story, bringing it to life through light and filling their bedroom with wonder and magic. 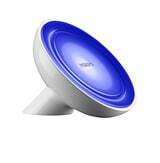 The next generation Philips LivingColors Bloom, €79.95, and Philips LightStrips, €89.95, Friends of hue are available in Apple stores from 8th August 2013. For further information please visit www.meethue.com.